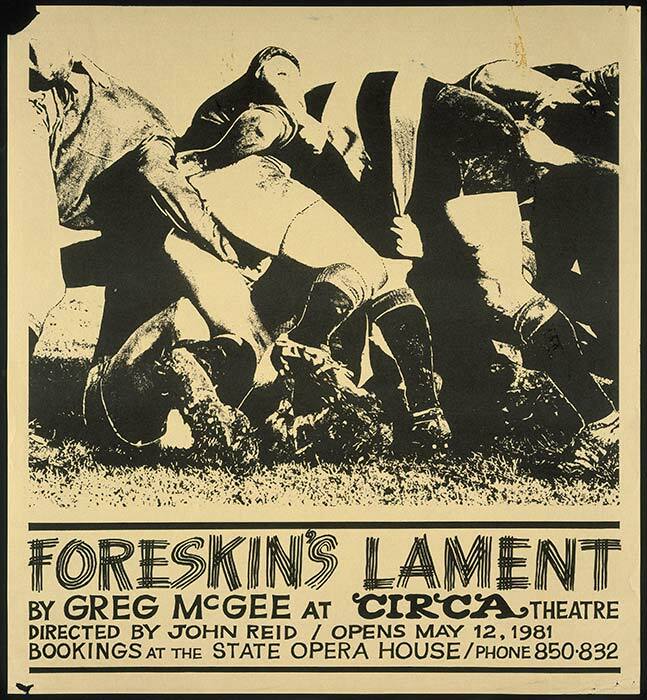 Greg McGee's Foreskin's lament, set in a rugby changing room, became a landmark of New Zealand theatre from its first performance in 1981. McGee had earlier trialled for the junior All Blacks, and the authenticity of his play's action and dialogue both shocked and enthralled audiences. Foreskin's lament appeared immediately before and during massive nationwide protests against the visiting Springbok rugby team. Both the play and the protests ensured that rugby's place in New Zealand identity would never be the same again. This is the poster for the first season of Foreskin's lament at Wellington's Circa Theatre in 1981.